Couldn't find specific thread to this on ESK, so posting this here as a reminder/reference. ARSCC(UK) will be picketing in East Grinstead Saturday May 31st. We are in contact with the police and will hopefully be setting up in the High Street from 11 AM. Saint Hill (UK Scilon HQ) as previously discussed here is a couple of miles outside town and unsuitable for large numbers to protest. The happy fun cult is well known, half of its UK members (and many ex-members!) live nearby, so we will get plenty of interest in town. The CoS has several small establishments in town but nothing major. Anonymous are of course invited! 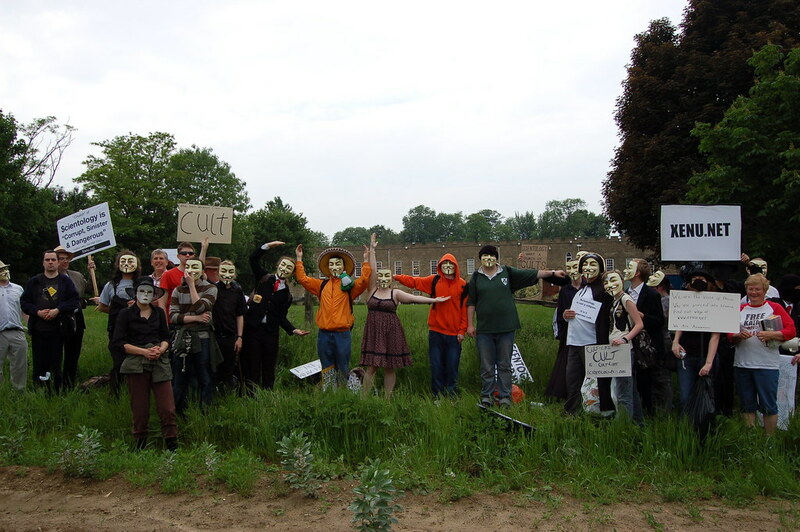 We are doing this between the main Anonymous events so that Anon from London and Brighton can attend. I so wish i could go to this,but unfortunately have to work all weekend. I will be with you all in Spirit though, hope it all goes really well. Rock on Anonymous and the OG. Yup, gonna be there all right. As you might tell by now, this went very, very well. Like one Anon said it; We went to the dragons den, moved up to the dragon, and then poked him in the eye. Spent much time in East Grinstead High street getting lots of support from the locals, and a couple of abusive shouts and wierd requests from local Scilons. The incident that sits best with me was an American lady coming up and asking me and another person who paid us to do this. After much enturbulating, and an incident involving a sign that the police found inappropriate, either Bonnie or Richard Woods came up with the brilliant idea of marching up to St. Hill. This sat well with Anon, and the march began. After about 30 minutes we all arrive at the mouth of the dragon, and spend some time enturbulating scilons coming in and out of St. Hill. Then there is yet another idea from the Woods camp, there is a path which can take you around the actual grounds of St. Hill and get you up to a point where you are in full view of the castle. After one of the most utterly bizarre hiking trips I've ever undertaken (and I've been in the military), we arrive at the eye of the dragon and proceed to poke lightly. The scilons were not happy with us, but kept their mouths shut. We even managed to get around and stand right outside the windows of their traning and auditing rooms. Seriously, today we have scared the thetans out of the scilons, and I believe that David the dwarf will never recover from the blow. Pictures are forthcoming, 4% uploaded now. Also, I believe James has a couple of very interesting stories. 1. Are you a nutter? 3. What is you name? 4. You where a pervert in my house. I tried to give her a copy of Gene Zimmers report, but she threw it back quite forcefully at me and another Anon. This was supposedly caught on video camera, though not yet checked youtube to see if is been posted yet. All round it was an interesting day, far more eventful than a London protest. And managed to finish off the day with the London Circle line party, essentially a flash mob of people (thousands actually) who all decided to have a drink and a party on the tube on the day before the ban on drinking alcohol kicks in. Didn't meet any anons on the tube, but was good fun anyway. Please post more links as and when they are found. Yes, my set (the link with Orderous in it from James), is now fully updated and uploaded, although the continuity is a bit screwed, sorry about that. Update; This is simply to post one of the images. Maybe not the best, but definately the most iconic. Fair warning since this forum is also seen by Scientologists and others who might not want it; These videos do contain OTIII references galore. Considering the ENG case, this is probarbly the most important footage from the protest. A protestor was asked to remove his sign because it had the words "brainwashing" and "evil" connected to the Church of Scientology. WARNING! Video has scilon lady speaking her mind about SP protesters, if you've ever seen a picket video before you know not to show this to your kids. Beyond that I'll let James explain what actually happened if he feels like it. General summary of the whole day, however, at the end there are two short but extremely interesting interviews. SEE THIS! Last edited by Orderous on Tue Jun 03, 2008 9:19 pm, edited 3 times in total. Wow, you had a fantastic day by the looks of it. The photo above is Fantastic Orderous. Obviously a day of Win Win Win! Just been looking at all the vids and footage on Winstead. I am so annoyed i had to work. You guys and gals did a brilliant job. Very interesting chat on Enturb, unfortunately still haven't heard back from admin. One point i'd like to bring up, someone said they had directed an 11 year old to Lisa Mcpherson site. Whilst this is a very important site and very much needs to be made as publicly known as possible, i don't recommend directing young kids there. I am fully aware of Scientology and what they do and as a grown adult i had nightmares for a week + after looking at the pictures of Lisa Mc Pherson, admitedly i was very sick at the time, but even so that is one hell of a thing for adults to deal with let alone children. Whilst Anonymous masks do not frighten kids, i think pics of Lisa will,it may scare kids into not joining Scientology but may frighten them unnecessarily and add fuel to Scientologys' chant "your frightening the children". Scientology frightens children enough already as seen by the testimony of ex kids.Just my thoughts, i'm sure there was no intent to scare. Fantastic win by Anonymous and OG, see you on the 14th. Sharon wrote: One point i'd like to bring up, someone said they had directed an 11 year old to Lisa Mcpherson site. Whilst this is a very important site and very much needs to be made as publicly known as possible, i don't recommend directing young kids there. I am fully aware of Scientology and what they do and as a grown adult i had nightmares for a week + after looking at the pictures of Lisa Mc Pherson, admitedly i was very sick at the time, but even so that is one hell of a thing for adults to deal with let alone children. I believe the link was a part of the sign (whyaretheydead), and anyone seeing it is capable of finding the site, so I don't think driller was specifically asking the kid to check it out. That being said, the coroners pictures are not exactly kid friendly, but are also posted with rather huge disclaimers on the website. Btw; What's the problem you're having at Enturb since you can't get in?